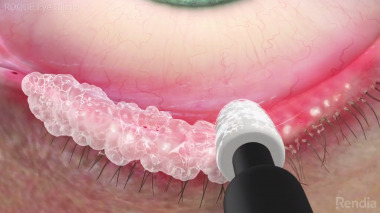 Note that none of the treatment suggestions for Demodex blepharitis has been FDA approved. Historical management of Demodex blepharitis involves a treatment regimen that is divided into in-office care and at-home care. In the office, D folliculorum can be lured to the follicle surface with the use of volatile fluids, such as ether (not allowed in the United States), brushed vigorously across the external lid margin, following 0.5% proparacaine instillation. Five minutes later, a solution of 70% alcohol is applied in a similar manner. This regimen is reported to successfully reduce both the symptoms and the observed number of mites by the end of 3 weekly visits. Ether and alcohol should be used with caution, and corneal contact should be prevented. A combination of this in-office treatment with a home regimen is suggested. The home regimen includes scrubbing the eyelids twice daily with baby shampoo diluted with water to yield a 50% dilution and applying an antibiotic ointment at night until resolution of symptoms. Various treatments have been used to control Demodex mites. Most treatments involve spreading an ointment at the base of the eyelashes at night to trap mites as they emerge from their burrow and/or move from one follicle to another. Mercury oxide 1% ointment is frequently used. Ivermectin 1% cream (Soolantra, Galderma Labs) has been approved by the FDA for the treatment of rosacea. It may be applied to eyelashes and eyelids once daily. It may have beneficial effects as early as 2 weeks and may be used safely up to 52 weeks, depending on the severity of the Demodex infestation. Prior to treatment with terpinon-4-ol (Cliradex, a natural tea tree oil product), 50% tea tree oil with Macadamia nut oil was the most popular treatment method. This is applied with cotton tip applicators, after one drop of tetracaine. [10, 11, 12, 5] Aggressively debride the lashes and the lash roots first with scrubs. Try to get the oil into the lash roots and along the lashes to kill any eggs. Treat the eyebrows as well. Three applications, 10 minutes apart, per visit are recommended; treatment is completed with compounded 20% tea tree ointment. Repeat for 3 visits, each one week apart. Use tea tree shampoo on hair and eye lashes every day. Use tea tree soap or face wash every day. Buy new makeup and discard old makeup; do not use makeup for 1 week. Clean sheets and buy new pillows. Check spouse; if both have this problem, both need to be treated. For the first few weeks, use the ointment at night after tea tree shampoo scrubs. If inflammation is present, combination steroid-antibiotic ointments may be applied for one week. This is then replaced with a pure antibiotic ointment or with compounded 10% tea tree ointment. The latest promising treatment regimen includes the use of Cliradex, a commercially available natural product, isolating terpinon-4-ol from tea tree oil. A medicated towelette is used twice daily as an eyelid and eyelash wipe. Weekly follow-up visits for 4 weeks may be necessary in severe cases to monitor the effects of in-office and at-home treatment regimen.